GOETHE FILMS brings the best of German film to Toronto audiences. Ranging from features to docs, shorts to animation, drama to comedy, the experimental to international festival highlights from Berlin, Leipzig or Oberhausen, the GOETHE FILMS series offers film lovers the opportunity to see a top selection of German contemporary arthouse film in Toronto’s premier cinema. Programmed and presented by the Goethe-Institut Toronto since 2011, the films are presented in thematic clusters throughout the year at the TIFF Bell Lightbox in downtown Toronto. Many screenings are enhanced by introductions, Q & A’s as well as discussions with diverse German and Canadian artists, curators and experts, who contextualize what happens on the screen and engage with the audience. As a reflection of the refugee situation in Europe, the GOETHE FILMS series "Europe between Refuge and Fortress" 2016 presented Oscar-shortlisted "We Are Young. We Are Strong" alongside recent shorts and documentaries examining Europe’s future. Senator Ratna Omidvar, author and journalist Kamal Al-Solaylee and Syrian-Canadian filmmaker Marcelle Aleid hotly debated the role of art in political crises. Other highlights include "fHEISTy Woman Robbing Banks", featuring female bank robbers from the 1998 classic RUN LOLA RUN to the 2015 one-shot wonder VICTORIA, as well as the series "Copy & Paste" about homages, influences and references between directors, which examined how Murnau & Herzog, Petzold & Farocki and Müller & Girardet remake, remix and reimagine films and film. Thematic retrospectives of Wim Wender’s and Fatih Akin’s oeuvre proved to be particularly attractive. GOETHE FILMS has been called "one of Toronto’s better-kept arthouse secrets" by blogTO.com. 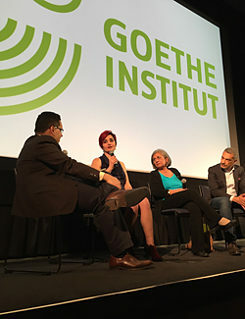 Affan Chowdhry, Marcelle Aleid, Ratna Omidvar & Kamal Al-Solaylee | GOETHE FILMS: A Long Way: Europe between refuge and fortress, 2016 | Photo: Goethe-Institut Toronto "Many excellent German films don’t get Canadian distribution and when they do, their theatrical run here is often limited. This is a great opportunity for Toronto audiences to see some of the best films coming out of Germany right now, films that they would probably otherwise miss," explains Jutta Brendemühl, the Goethe-Institut’s Program Curator, who founded and is programming the series. "GOETHE FILMS is the heart of our extensive film work. Next to our popular film blog, it’s where we get to share our passion for Kino with our loyal Canadian audiences."